After a spell of 'Do what I say, not what I do' diplomacy, the U.S. has an opportunity to bring human rights back to the bargaining table in dealing with China and other states. Two weeks before Hillary Clinton made her now infamous comments about how human rights concerns can&apos;t interfere with solving the world&apos;s myriad other problems — comments interpreted by some as a rookie gaffe and by others as a serious policy pronouncement — a more telling human rights event occurred in Geneva, Switzerland. China, in early February, stood before the U.N. Human Rights Council for its Universal Periodic Review, a once-in-four-years assessment of human rights each U.N. member country must now undergo at the hands of its peers. Russia praised China&apos;s economic investment in Tibet; Sri Lanka praised China for ensuring the political rights of its people; Sudan praised the legal basis for China&apos;s "re-education through labor" camps. The United States, also in the room, declined to comment. The episode riled human rights advocates, in part as an illustration of two disquieting trends: China&apos;s growing influence outside the human rights sphere, and the United States&apos; loss of moral authority inside of it. Add the global recession and China&apos;s clout as the holder of much United States debt, and "one way to look at this whole thing," said Thomas Kellogg, a China expert with the Open Society Institute, "is that it accelerates and intensifies or highlights various long-term trends that have been raising red flags for the human rights movement for several years now. "For quite some time now, it seemed to be the case that the amount of leverage that Western governments had over China has been somewhat limited." As Barack Obama explained on the campaign trail last spring, when the problem was George W. Bush’s and not his (and the scope of the problem arguably smaller): "It&apos;s very hard to tell your banker that he&apos;s wrong." Not since the end of the Cold War, Kellogg points out, has a country come into its own as a world power that is neither liberal nor democratic. As such, the values of China’s government don’t quite jibe with the core principles of international human rights mechanisms. China&apos;s authoritarian government is directly vested in maintaining a litany of human rights violations: restricting access to the Internet, censoring the media, controlling dissidents, suppressing religious freedom and manipulating the rule of law. The U.S., at this same moment, is groping to re-enter international human rights bodies the previous administration shunned, following an era in which American policy disregarded some of the core human rights principles it once helped to articulate. The United States’ own questionable human rights record has become one of the main narratives of the wars in Iraq and Afghanistan, with prisoner abuses revealed at Abu Ghraib, waterboarding at Guantanamo and renditioning of suspects to secret prison sites in Africa. The U.S. in some cases not only ignored international human rights treaties it once signed, but crafted new legal reasoning to support its abuses. As part of its effort to turn a new page, the Obama administration announced early April that it intends to run for a seat on the Human Rights Council, a body often criticized (frequently so by the Bush administration) as jokingly ineffective. The council’s troubled predecessor, the U.N. Commission on Human Rights, controversially elected Sudan to membership in 2004 in the midst of what the U.S. considered ethnic cleansing in Darfur. Back in Geneva in early February, the U.S. was still entitled to speak, as a U.N. member country, at China’s review. Groups like Human Rights Watch had for months prior to Obama’s inauguration been encouraging the administration to do so. 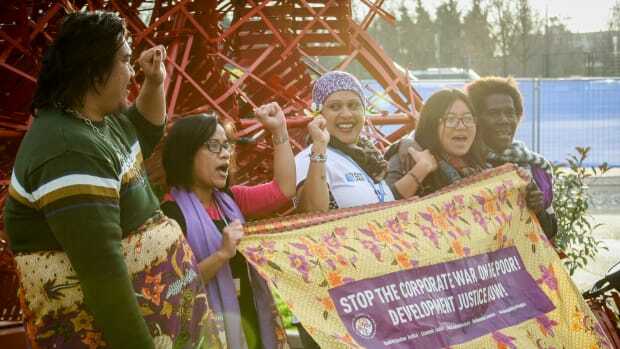 “Frankly, I think if they all sat down and thought about it, in an hour, they would have come up [in February] with the position they finally came up with [in early April],” said Sophie Richardson, the Asia advocacy director for Human Rights Watch. Richardson went to Geneva to meet with delegates before the periodic review, and what she heard on the part of China’s eventual backers — many receive economic aid from the Chinese — amounted to, in her view, coordinated talking points. While the U.S. was silent, the Chinese appear not only to have been vocal, but also to have lined up vocal defenders. “They moved pretty quickly to fill that vacuum,” Richardson said of the hole U.S. lethargy has left in the human rights community. “And this administration has real work to do to fight to get back even to where we were eight years ago. Not participating in the UPR, going to Beijing and saying ‘human rights shouldn’t interfere’ is not the road to recovery.” William Schulz, former executive director of Amnesty International USA, earlier this year wrote a report for the left-leaning Center for American Progress proposing how the U.S. should now engage China on human rights. China’s rise as an economic power won’t necessarily translate into greater influence in the human rights community, he suggests; human rights norms have become too global over the last half-century to be diluted now by the biggest abusers. Countries are no longer modeling their human rights records, he says, on the most economically powerful. The International Criminal Court may yet succeed without the backing of the U.S., China and Russia. And just as some countries the last eight years were unafraid to criticize the U.S. for its abuses, the same principle suggests China may not be able to intimidate on financial might alone. Just as China recognizes it must live by the global economic norms of the WTO, Schulz suggests the same eventually will be true of global human rights norms. China experts also say the regime is more vulnerable than outsiders think; the country’s position is weaker domestically than its expanding reputation abroad. Its economic future is tethered to the U.S. just as much as the U.S. is tied to it. And the recession will likely intensify domestic unrest in a year of already problematic anniversaries: This year marks 20 years since the Tiananmen Square protests, and 50 years since the Tibetan uprising. “It’s a particularly ugly combination,” Richardson suggested. One major philosophical rift remains, though, between China and the mainstream of the human rights community, as is frequently seen on the U.N. Security Council. Historically, she concedes, “God knows the rest of the world has given them plenty of reasons to believe this.” But nonintervention is as much a convenient excuse as a coherent philosophy when it serves to protect the status quo of a repressive regime. America’s ability to evolve simultaneously as a counterweight may have just as much bearing on China’s influence in settings like the UPR going forward. Human rights advocates have been nearly universal in their optimism. “I have, as many do, great hopes for a significant change in terms of the importance of human rights for the U.S. government in this administration versus the last administration, and that’s got little to do with the way I personally may vote in elections,” said Jim Cavallaro, executive director of the Harvard Human Rights Program. During that time, as Schulz put it, the measurer became the measured — a point occasionally made by the Chinese themselves in response to American criticism of Chinese failings. Now, aside from Clinton’s rocky debut, Schulz points to a roster of human rights heavyweights working in the new administration: National Security Council Member Samantha Power, Ambassador to the U.N. Susan Rice, and legal adviser to the State Department Harold Koh, the former dean of Yale Law School and, in Schulz’s words, the most respected human rights scholar in the U.S.
Richardson suggests that what the human rights community most needs from the new administration at this point is a major foreign policy speech from Obama articulating not just a few well-intentioned goals — shutting down Guantanamo, reversing the global gag rule — but an overarching agenda for human rights. Schulz offers yet another perspective — that how the U.S. handles the escalating war in Afghanistan will have just as much bearing on America’s influence on human rights as the economy will. The U.S. may need to rein in what skeptics emphasize as its Treasury-bond ties to China, but restoring its moral authority abroad involves plenty of other countries to which the U.S. is not financially beholden. Through the president’s first major trips overseas — across Europe and then, more recently, to the Summit of the Americas — pundits have begun piecing together what looks like an Obama doctrine, strategy that speaks to general American engagement abroad but also the more specific question of American moral authority. Obama is emphasizing not what America will do the day it regains its old role as world leader — a role that may be outdated anyway — but what other countries will see in the process of trying to get there. “If we are practicing what we preach, and if we occasionally confess to having strayed from our values and our ideals, that strengthens our hand. That allows us to speak with greater moral force and clarity around these issues,” he said at a press conference in Trinidad. Analysis: Two longtime opponents of nuclear weapons reflect on heady times as the Obama administration puts disarmament back on the map. New research suggests that to be effective, counterterrorism efforts should support human rights, rather than violate them. 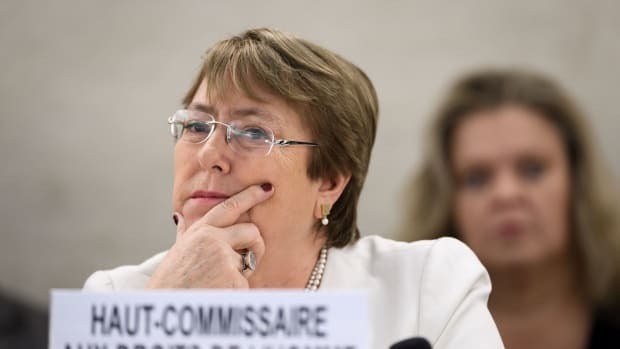 Michelle Bachelet's bold speech condemned the Trump administration's family separation policy along with other human rights abuses.